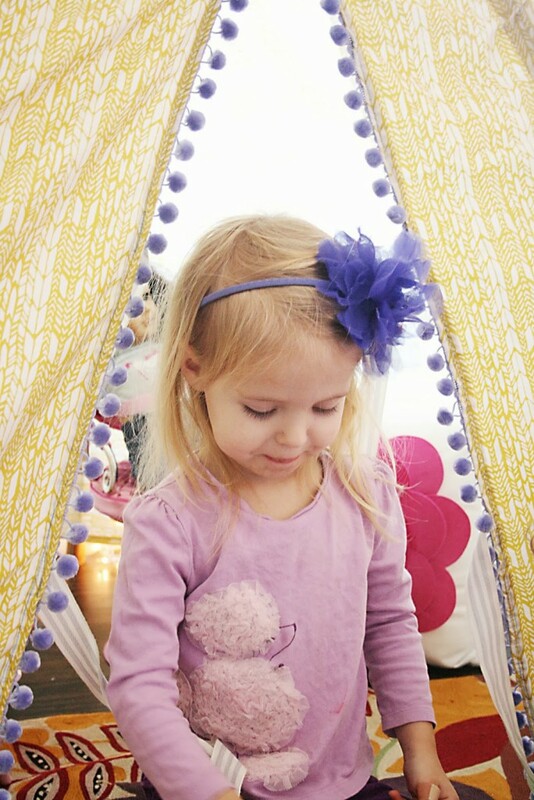 Making a homemade tee pee tent has been on my long list of “things to make” for my children. Since it was a project on the bottom of the list, I did not anticipate it happening anytime soon. 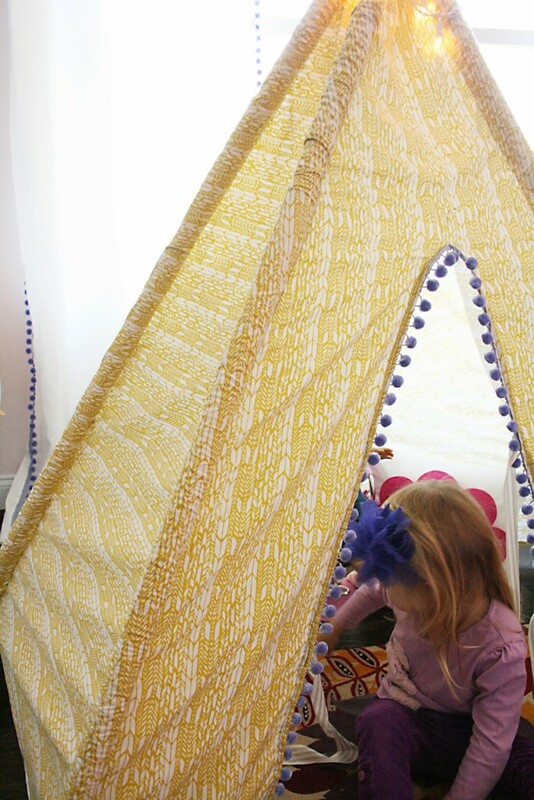 But with the holiday season, the thought of the children running down the stairs Christmas morning and seeing a tee pee strung with white lights and a welcoming front door for imaginary adventures made it sound magical and up’d its position on the list. So, Christmas Eve Eve was when I ran out and grabbed supplies and started the project. Once the kids were all in bed, I completed the tee pee in about 3 hours. Yes…I did stay up past my bedtime to complete. Talk about down to the wire! Thanks to pinterest, I found this tutorial from My Poppet. I wanted to keep cost down and was hesitant with some of the tutorials I found that called for yards of fabric because it can get really expensive, and I just didn’t have the time to go the fabric route. 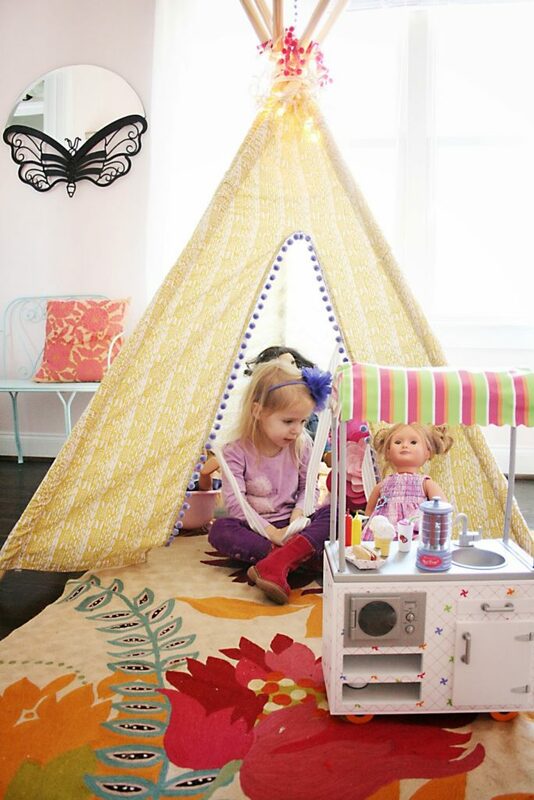 This tutorial uses one queen flat bed sheet. Perfect. Not a lot of brain damage, and one trip to Target took care of it. The wooden dowels were the most expensive item. I purchased them at home depot and had them cut to size. The purple pom pom trim I found in my sewing box. In the instruction, you sew tubes that the wooden dowels feed through, making the tee pee very secure and from falling over or falling apart. I strung white light around the top and pom pom trim. 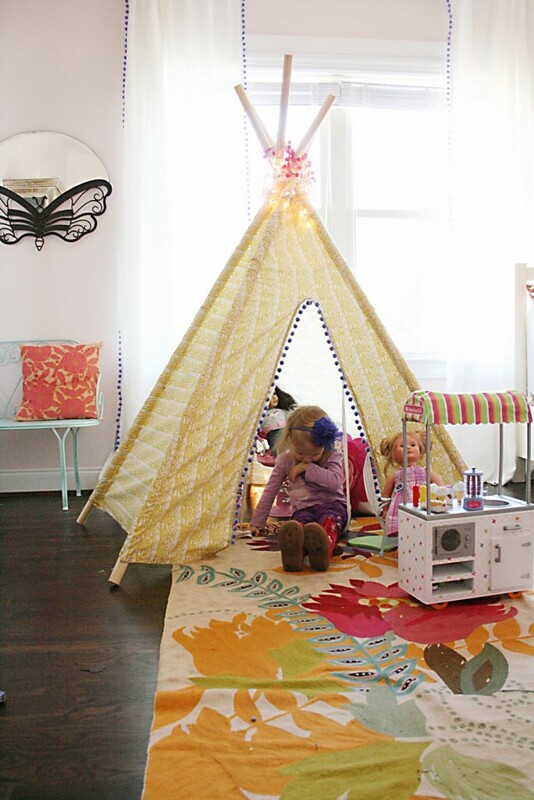 The tee pee transforms any nook into the perfect hideout. This has been on my to-do list for, oh, about two years. I've had the materials forever. 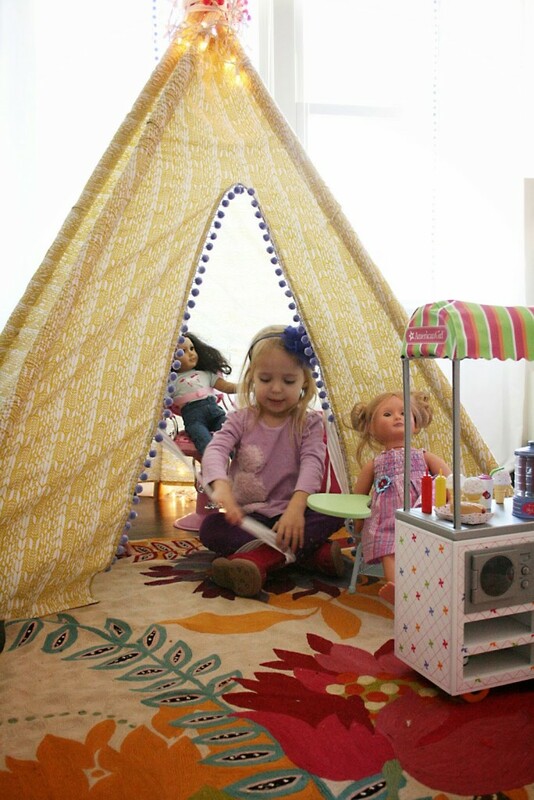 I looked at Lowes for dowels and couldn't believe how expensive it was going to be for two teepees (one for my daughter and one for my son). I found a much better price online at this place: http://www.craftparts.com/ I purchased connectors to put together two 36" dowels. Anyway, I've had the materials forever, but don't know how to sew so I'm hoping to commission someone to do this for me. Thank you so much for the link with the pattern! It is super helpful!